Oh yes, here's more mint coming atcha! 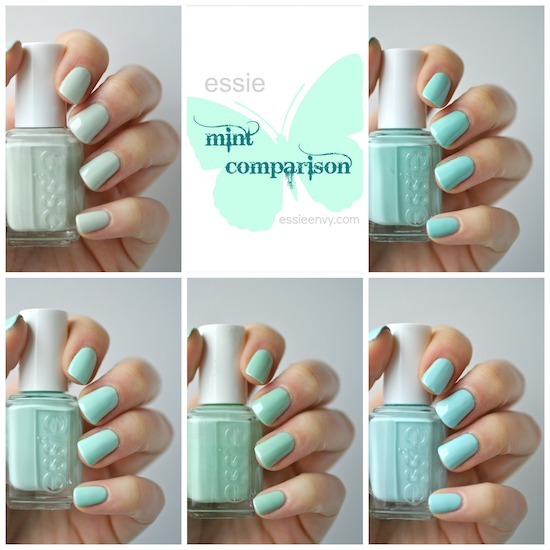 After posting about Mint Candy Apple and showing the old version and the new version of it, I thought it would be super helpful to see how the colours and formulas measure up next to other Essie mints in my collection. 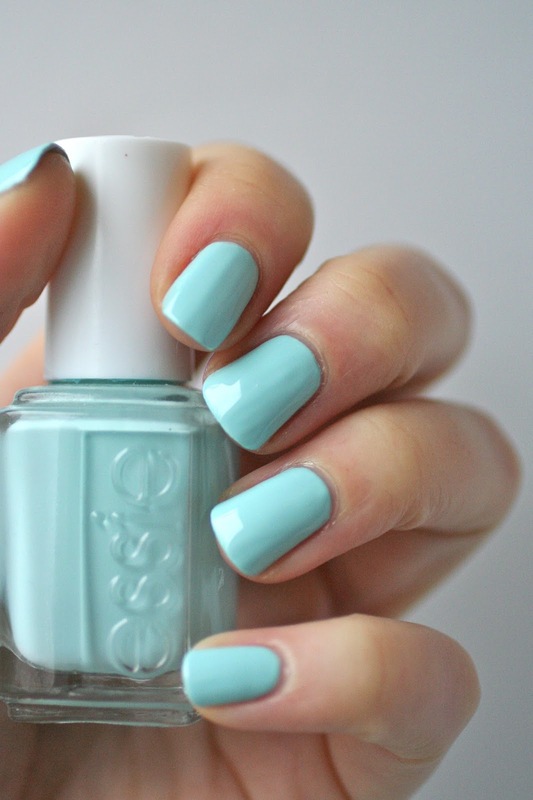 These polishes range from uber pale minty green to robin's egg minty blue. 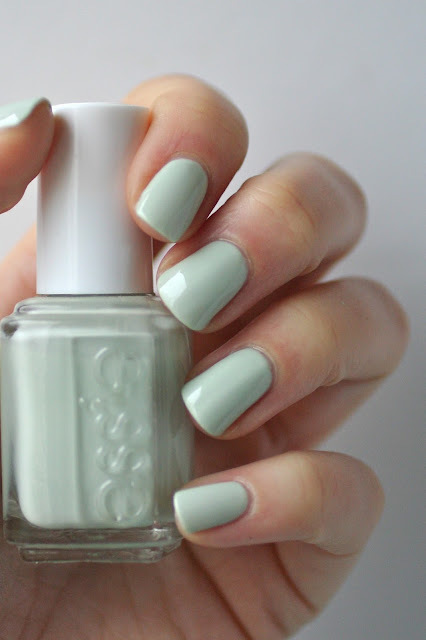 I wrote about this beautiful icy sea foam green back in the day when I first started this blog. It's a really nice change up from a typical mint shade since it isn't as saturated in colour as other mints. This polish came out in the Summer 2011 Brazilliant collection. When I applied this polish, the first coat was sheer but easy to work with. The formula is really smooth and self-leveling and opaque in 2-3 coats (some nails needed a 3rd but not all). 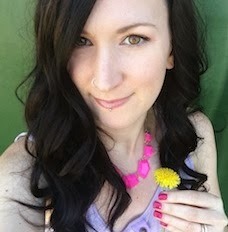 Fashion Playground came out in the Spring 2014 collection called Hide & Go Chic and I swooned HARD over this entire collection. This minty polish definitely leans more green, which Essie calls "pistachio" and it has a very fine subtle shimmer running through it. 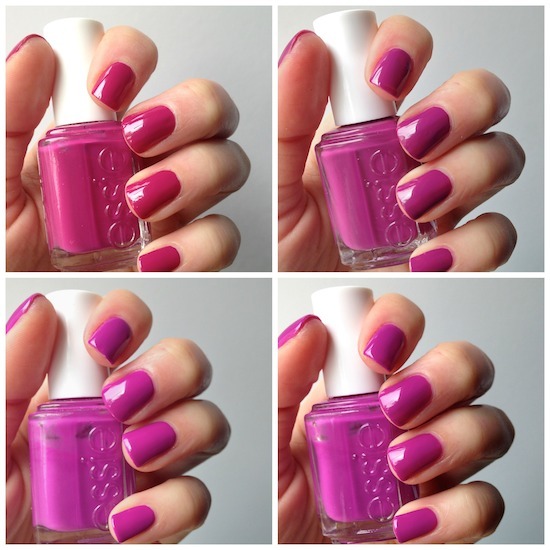 Fashion Playground is very sheer on the first coat, however, it was smooth and easy to apply. It needs 3 coats and is still very slightly see-through, but it's not streaky. 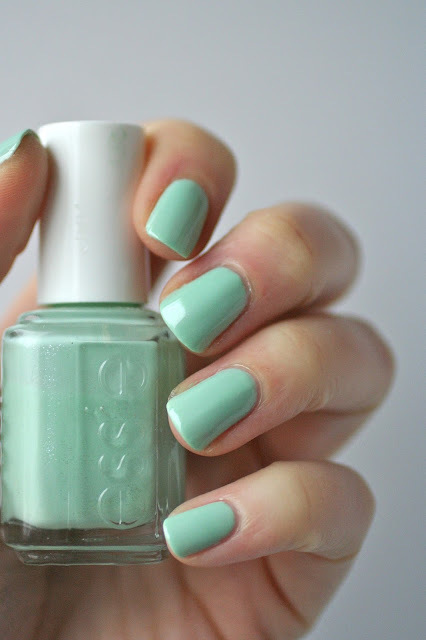 If you missed my Mint Candy Apple post about the old version and the new updated colour and formula, I suggest you go read it. This new version is definitely much greener than the old Mint Candy Apple but the formula is 100% better. It's so much smoother and easier to polish with. It self-levels really nicely and is opaque in 2 coats. Oh Blossom Dandy. I freaking loved this mint polish when it came out this past Spring in the Flowerista collection. At the time I had no idea there was an updated formula for Mint Candy Apple, so when I swatched it I just thought "this mint polish blows Mint Candy Apple out of the water!" It is so smooth and buttery. 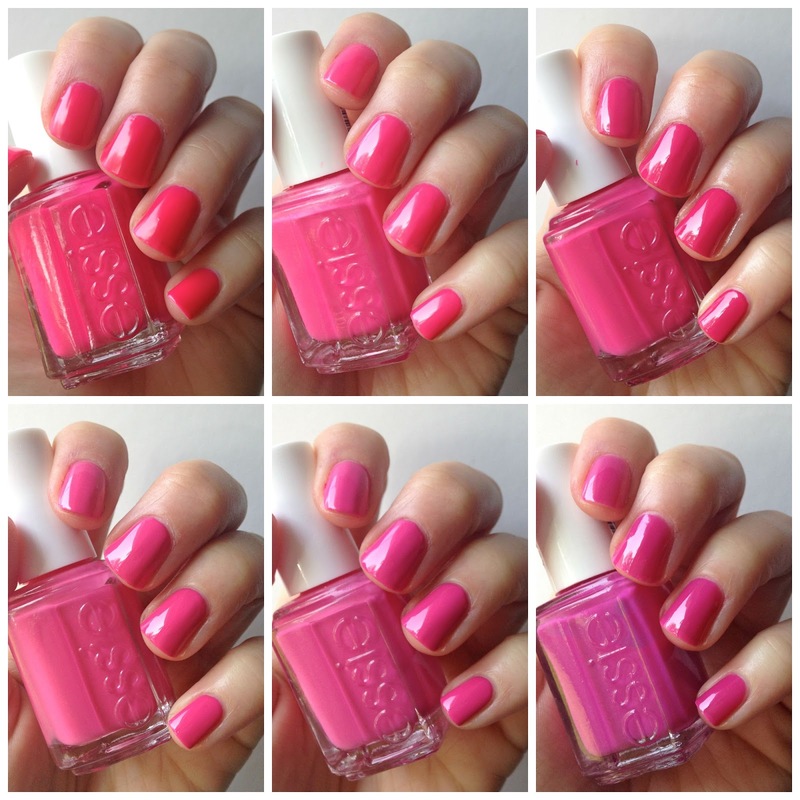 It's really easy to apply and very opaque, so it's perfect in 2 coats. It self-levels really nicely and was the only mint out of all 5 of these that didn't need topcoat to smooth everything out for photos. 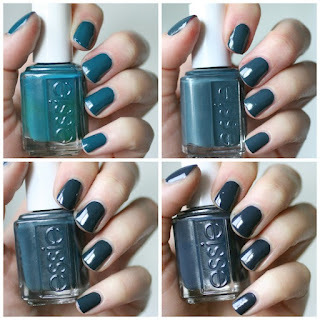 None of these mint polishes are dupes for one another, although in the bottle some of them look so close! I expected old Mint Candy Apple to be identical to Blossom Dandy and Fashion Playground to be the exact colour of new Mint Candy Apple. But old Mint Candy Apple is slightly bluer and brighter than Blossom Dandy. The new Mint Candy Apple is more opaque and brighter than Fashion Playground and there's also no shimmer, (although Fashion Playground's shimmer is almost undetectable). 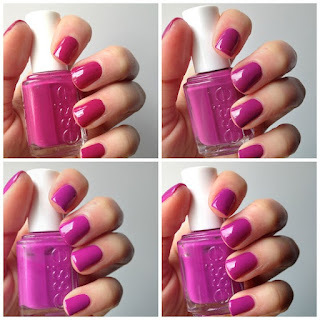 I really love doing these comparisons because I get to go up close and personal with these polishes and scrutinize their formulas and I often walk away with a new favourite. My favourite mints were clear to me doing these swatches: Blossom Dandy, new Mint Candy Apple and Absolutely Shore (ugh, I couldn't pick just ONE). Blossom Dandy is the perfect blue mint, new Mint Candy Apple gives me a beautiful green mint and Absolutely Shore is completely different and I love it, especially in the winter time. When the other mints feel too bright for winter, Absolutely Shore is the perfect answer. 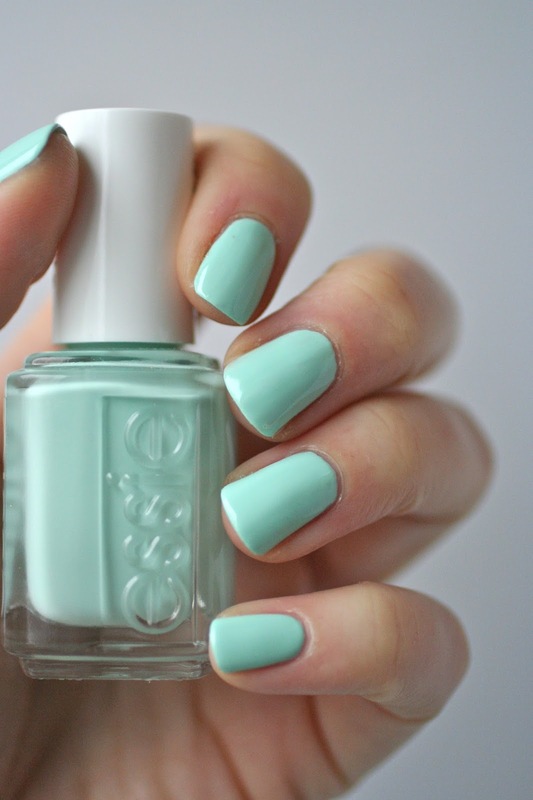 Which mint polish do you pick? 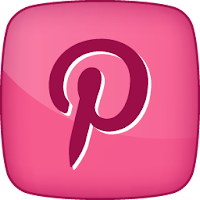 My favorite mint is Fashion Playground. Looks great with Chinchilly! 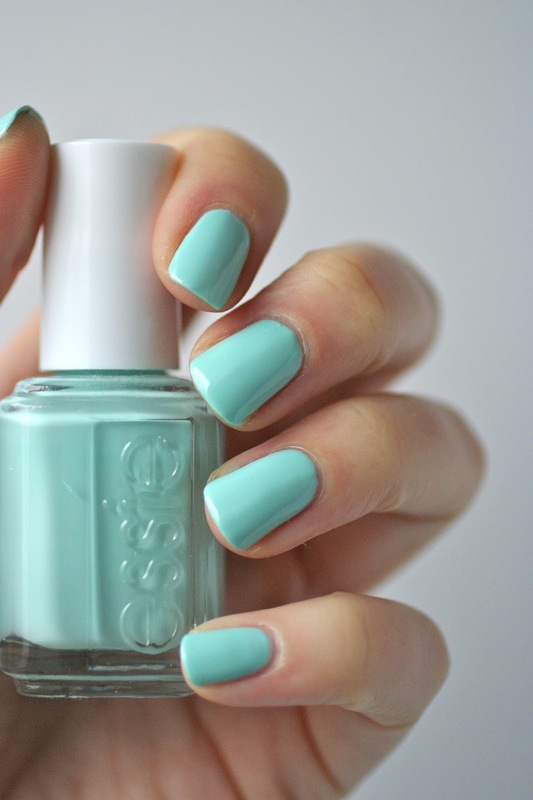 However, I have been curious to try out Mint Candy Apple - seems like such an Essie staple! I'd like to throw another polish into the mix. I recently acquired Yespedrilles and I think it's identical to Fashion Playground. I don't yet know what the formula is like but as far as looks are concerned it seems to me that Yespedrilles is just matte and that disperses some of the shimmer. I really think that's the only difference, and am curious to hear your opinion.